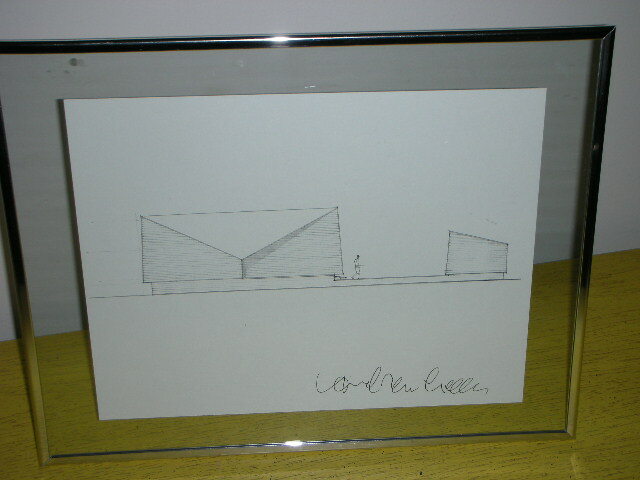 Or how we met then man who designed our house and came away with two of his beach house sketches. We had the best time last night. DWR East Hampton hosted a fundraising event for the Pearlroth House with a presentation detailing the efforts to save the building by the filmmaker Jake Gorst who also happens to be the architect's grandson. Andrew Geller himself was there and the highlight for us was talking to him about our house, which I hope he'll come and see soon, just to make sure the renovations we are undertaking meet with his approval! There was also a raffle and the biggest surprise was that Steven won, not once but twice. He chose these signed sketches by Mr Geller. I suppose etiquette dictates that we should have put one back in the raffle but they look fabulous together and they are going into an Andrew M. Geller house, so in a sense they are going home. Oh, and I won a bag of swag, too courtesy of Vox, so it was a totally rewarding evening in the Hamptons. A lot more money is needed to secure the future of the iconic "kite house". So if anyone reading this feels they can make a tax deductible contribution or any corporations are interested in sponsoring the work please contact The Pearlroth House Foundation.